The archive stays open late tonight so it means I walk home from the train station in the dusky dark. The fireflies were out, which made me happy. Fireflies remind me of summers at my grandparents' place in Ohio (I guess it is too cold in Ontario for fireflies). An extra long day of research meant little was happening in the kitchen today. 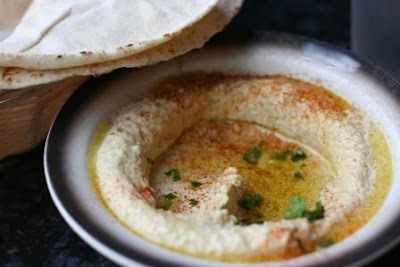 I did stop by the Sahara Grill today for a light lunch of pitas and hummus. It wasn't bad, but nothing special. As you can see, they pour oil over the top (not necessary) and it was more tangy than I like it. Oh well. 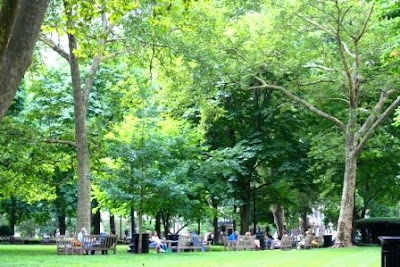 I then went to Rittenhouse Square and relaxed in the shade before heading back to work.